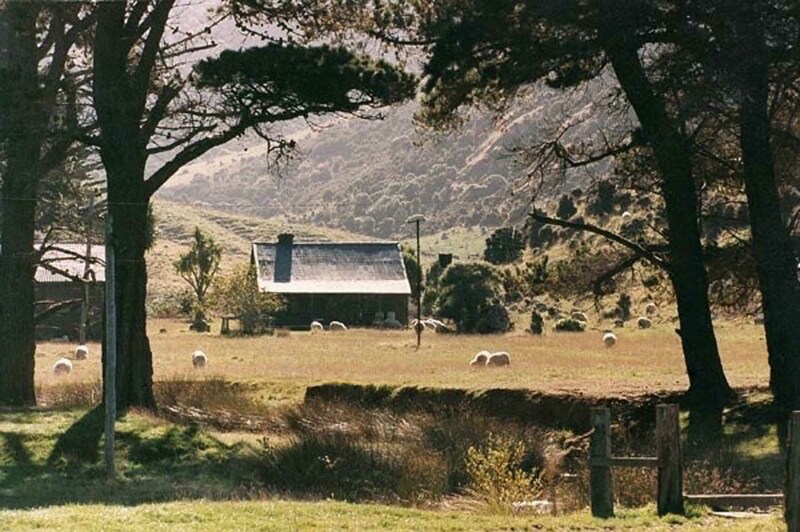 Flea Bay Cottage is the accommodation for the second night of the three-day classic walk and the midday stop for the two-day hikers option. It offers a step back in time, having been built 160 years ago and altered through the years to meet the needs of the growing family. In recent years other cottages have been added as have an extra abultion block. 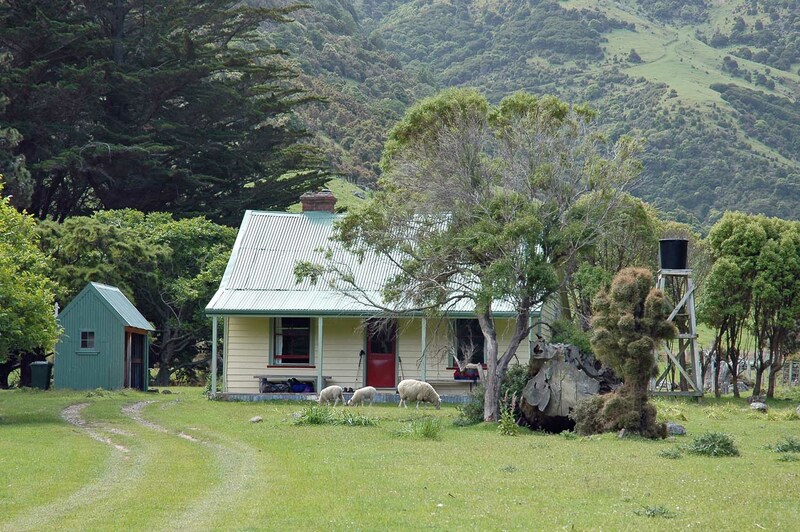 Flea Bay Cottage is set just 200m back from a safe swimming beach and has verandah views of the bay and Pōhatu marine reserve. It has a piano and a selection of books for relaxation. On chillier days there is a log burner surrounded by sofas to enjoy a warm and friendly evening together. The Helps family have worked to protect the Pōhatu little penguin colony for many years and share this with others through their family business, Pōhatu Penguins. 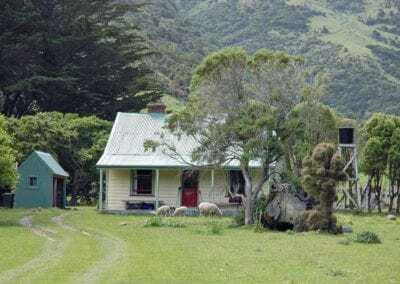 Banks Track walkers are offered a free penguin tour and an opportunity to book a kayak trip in the Pōhatu Marine Reserve while staying at Flea Bay Cottage. 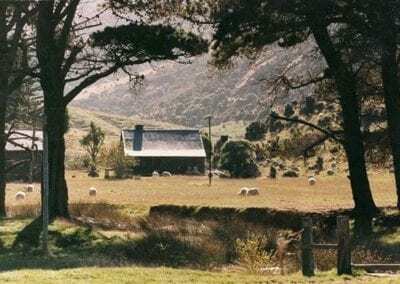 Banks Track walkers staying at Flea Bay on the three-day classic walk have the option to join the team at Pohatu Penguins for a free penguin tour in the evening. Details of the time and place to meet are available in the cottage. This is seasonal, usually from October to mid-January. It offers an opporuntity to see little penguins, and occassionly the yellow-eyed penguin, as they come ashore in the evening and make their way to their nesting sites. Banks Track walkers who are keen to kayak within the Pohatu Marine Reserve can book a tour (subject to weather condition) with the Pohatu Penguin team prior to beginning their walk. The kayaking take place the following morning before you depart for Stony Bay. Book you kayak trip here. There is no mobile coverage at Flea Bay. Walkers have the option to book a private room. There are two designated private rooms at each accommodation that can be pre-booked. They are double rooms with bedding and towels provided. These have proved extremely popular since this option was introduced. If you would like to book a private room it is advisable to reserve it at the time you make your booking. The cost is $150 for the two-day hikers option and $225 for the three-day classic walk.